Would You Rather: Wear Dirty Underwear, Or Go Without? 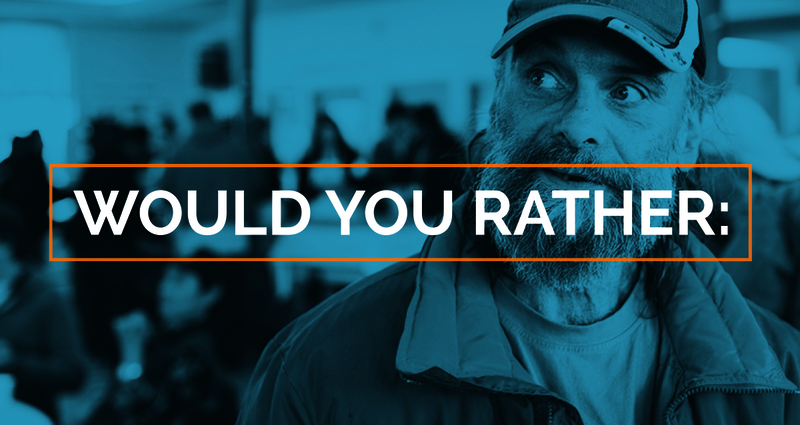 …Sadly, this is a decision people experiencing homelessness have to make every single day. For people who are homeless in Edmonton, gaining access to new, clean underwear is difficult. Some individuals may wear the same pair of underwear for months at a time, and some may go without underwear for just as long. Underwear is one of the most requested items by the people who use Bissell Centre services, but one of the least donated items. So, let’s pass the question onto you. Would you rather wear dirty underwear, or go without? Wearing dirty underwear may not seem like a big deal at first, but as the weeks pass, bacteria and microbes will accumulate causing an embarrassing odour, irritating rash, and infection on your skin down there! If you’re a woman and you have a leak or accident during that time of the month, you’ll have no choice but to continue wearing the dirtied underwear, which can contribute to even more bacteria and microbe growth. Not to mention, after you shower and get all squeaky clean, you won’t have a fresh pair of undies to slip into and will have to pop on the smelly, old, bacteria-ridden pair. Going without underwear sounds fun —“freeing” even —but what happens when the inevitable chafing and skin irritation come along with it? You’ll have to deal with that gnarly skin rash for weeks on end! If you’re a woman and do not have access to female hygiene products, this decision could result in the use of unsanitary or improvised hygiene products, which could lead to an infection. Without the barrier of underwear, there’s a higher risk for foreign bacteria to make contact with your skin. Among other issues, there’s also a greater chance of fungi development because your underwear isn’t there to absorb your sweat. Wearing underwear is something that we often take for granted, but when faced with a decision like this, it is easy to see why clean underwear is so important to those who don’t always have access to it. For many people, especially homeless populations, the availability of fresh, clean underwear makes all the difference. This is why we created our #DropYourGonch campaign: so that no one in our community would have to make the decision between wearing dirty underwear, or going without. The Drop Your Gonch campaign aims to fill gaps in the Bissell Centre community closet by reaching out to our supporters to help stock it full of new underwear. The clean underwear donated by our supporters helps to provide our community with better personal health and hygiene, and a restored sense of dignity and self-worth.